I want to share my most cherished Christmas Tradition with you. It is Christmas Eve, and tonight I am going to Denny's. Back, a long, long time ago, during my senior year of High School, I was home alone for Christmas. I worked retail at the time, and like most folks who work retail, I didn't have a lot of luck getting days off around the holidays. So, when my family planned a trip out of town for Christmas, I was unable to attend. I was, on the other hand, able to lounge around the house in my underwear for a week, so that was a plus. And the reality that I was going to be alone on Christmas for the first time in my life didn't really staple itself to my forehead until Christmas Eve. This was before the age of Facebook, and I spent the evening eating ice cream for dinner and watching Christmas Story on TV. As the evening progressed I started to look around the empty house and every family filled Christmas Eve leading up to this one danced in the shadows. I was lonely. And I was depressed. And then my phone rang. It was my buddy Zach. "Johnny, put your pants on. We're coming to get you." "How did you know I wasn't wearing pants?" Twenty minutes later, Zach and three of my best friends in the world were at my doorstep. Knowing that I was alone on Christmas Eve, they had concluded their familial obligations and conspired to make my evening more jolly. Denny's at 11 PM on Christmas Eve tends not to be the most joyful place on earth. In fact, it can be bit depressing. They are open all night, and those that are working seem like they want to be there as much as those who are eating. But I was beaming. My buddies saving me from my pant-less, ice-cream filled depression spiral had invigorated me. We laughed and reminisced and joked. We talked to the tables around us. Our waitress ended up sitting with us for nearly a half an hour talking. And then, at the end of the night, in the spirit of the season we all tipped 100% of our bill, and she cried. 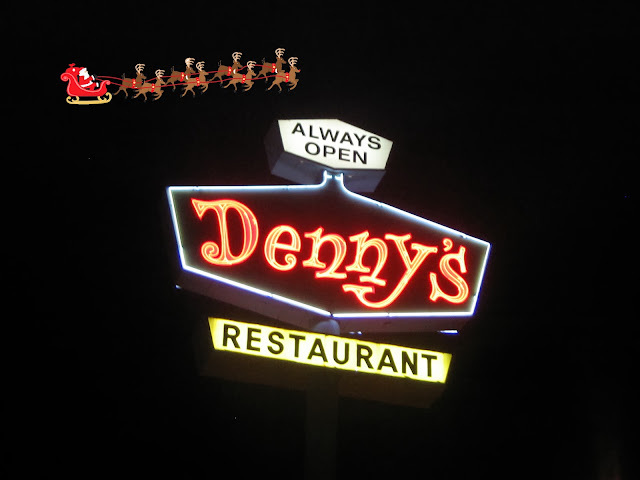 Since that night in 1999, on every Christmas Eve, after our family parties and dinners are done, and after the kids have gone to bed, those of us that can, return to that same Denny's. Not just the original few of us either. All are welcome. Depending on the year, our table has grown and shrunk. As our families have grown, some folks need to stay home with the kids. Some years we've had 30 people, some years 3. We added a white elephant gift exchange, and moved the time up to 10. The only rule has, and always will be, that you tip at least 100% of what you spend. I'm not sure how joyful the other 24-hour diners are across the country on Christmas Eve, but we do our best to make the one on 7200 South in Salt Lake City, Utah the center of all joy in the universe for at least a few hours. This will be our 15th year. When my kids are old enough, they will come too. I hope they will carry on the tradition long after I'm gone. If you know someone who is alone on Christmas Eve, go pick them up and take them to a 24 hour diner. Make them laugh, and feel less lonely. They will appreciate it far more than you will ever know. And don't forget to tip. A lot. What an amazing tradition! If there were 24 hour diners in the UK I'd totally do that. I love traditions like that; good for you for keeping it up! That. Is. Awesome. As someone who has been alone on Christmas Eve and Christmas day, I wish I had a tradition like that. Love it! So great how traditions get started in serendipitous ways. My husband and I both worked in churches for about 5 years. Our Culdesac neighbors were Jewish. They kept our kids for us on Christmas Eve. The mom made gingerbread cookies with all the children. We moved away from that culdesac 3 years ago, but we still make gingerbread cookies on Christmas Eve, and reminisce about those holiday moments with Aaron, Miriam, Mikaela and Johnathan.